This article is the fourth of an essay series on worldview, titled Between Jerusalem and Athens. Read the first here, the second here, and the third here. In the wonders of living, experiences that seemingly contradict each other can co-exist at once. Multiple thoughts and feelings happen at an instant, and while deconstructing them one by one is an interesting academic exercise, it does not fully reflect the unity of the experience as a whole. Recently, for the first time ever, I swam with sharks in the wild. My first encounter was at a site that was not supposed to be a shark site, but I saw a juvenile shark that came by a few times. From a distance, I could see something white and flat approaching. I thought, That’s either a white string ray, unlikely, or the belly of a shark. Sure enough, it was the latter, and also the main reason I went to the Bahamas. Was it scary? A little bit, sure, for I know what a shark could do when unhappy. My worry grew as it came closer, but more importantly, my excitement, too, grew. It was so graceful, beautiful, and wonderful, and the contours of their fins looked amazing against the blue vista. The video below was one of the times it swam by. Later on, we went to the shark arena, a spot where many Caribbean reef sharks gathered. Here, a group of us floated on the surface, holding on to a rope as precaution and watching about 30 sharks swim 20-feet below. We were instructed to stay still so as to not look like a distressed fish and attract the sharks, not necessarily because they would eat us—humans are not usually on their menu items—but because they were curious creatures. My husband and I were the first ones in and last ones out, although it was still too short for my taste. On land, we’re preconditioned to fear sharks. (Think Jaws.) Certainly, it was not possible to leave these thoughts behind while we were in the water. But this feeling of fear was not the only one present during those moments. Rather, there was also awe and love and wonder. As for me, I could not get enough of it. We were too far up and it was hard to see their full physiques. One day, I would get closer. If I were to be academic about it, I could try to analyze the experience and breakdown each component of my feelings. On wonder, what made me admire the creatures? What was it about this experience that impressed me? On fear, what made me worry about my safety? On paper, these two things seem to belong to separate categories, one a positive feeling and the other one negative. And I could say of this experience, “It was amazing,” or, “It was scary” as a single statement, and it would be fully justified. But in reality, they were there together in the same experience. The two feelings were interwoven, like two threads that made up a piece of fabric, such that I couldn’t separate which moments were fearful and which were wonderful. Such is life. In nature, the things that amaze us are often the same things that can cause fear. Of cliffs and rocks and mountains, grand and capable of destruction (or you could fall off them). Of the ocean, expansive and vast and dark and mysterious. Of creatures, beautiful and fierce. Many grand things have latent danger in them, and it’s perfectly natural to both love and fear them at the same time. Yet there is another aspect that brings this seemingly paradoxical experience to the next level. When I see shark divers, conservationists who swim with sharks in such close proximities and interact with them so naturally, they seem to have no fear of sharks whatsoever. They could do this because they love these sharks. My wonder may lead me to 20-feet away, but their love brings them much closer. I don’t think this is just a function of their courage. In their interaction, they are respectful and careful. There are boundaries that they honor between them and the creatures, an implicit covenant between human and fish that they would only admire and not harm each other. Certainly, they could not remain safe if they harassed these sharks. After all, the underwater world is the sharks’ home turf. Love casts out fear, someone said. I think its truth is evident in this situation. Nothing changes in the sharks themselves; they still have the potential to be dangerous, especially when their boundaries are crossed. But this does not prevent the interaction between humans and animals, because love gets rid of the fear and makes room for a connection between beings. 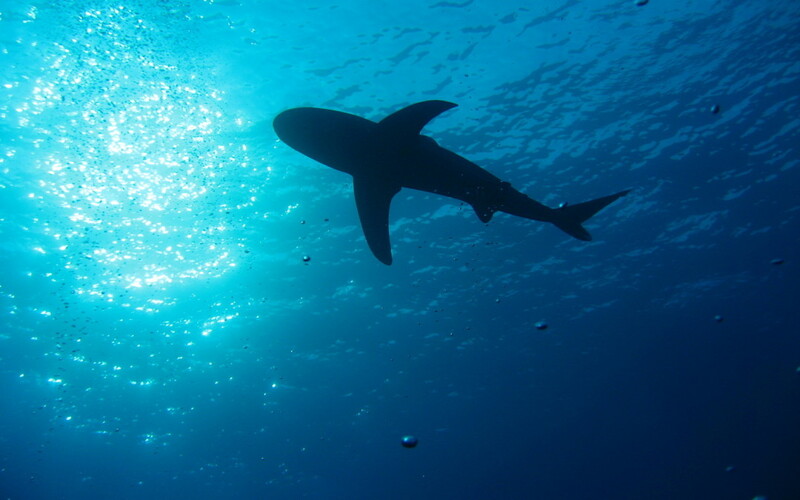 Check out One Ocean for a wonderful work on sharks. These Instragram accounts are also worthy to follow: @juansharks, @oneoceandiving, @oceanicramsey. Fear, here, is quite different than the fear of zombies, hypothetically. Same words, but distinct concepts.